Horses leave the starting gate during the 140th Preakness Stakes. UPDATE (June 6, 5:27 p.m.): The Belmont Stakes is today, so we’re unearthing this article about American Pharoah’s chances, and why the Belmont always seems to snag Triple Crown aspirants. On Saturday, American Pharoah (yes, it’s really spelled that way) won a muddy Preakness Stakes by an impressive seven lengths, leaving only the Belmont Stakes between him and becoming the first horse to win the Triple Crown since Affirmed in 1978. Commentators and oddsmakers both like his chances. But you should be wary. Though official pari-mutuel odds won’t be available for another two weeks, offshore sportsbooks immediately installed Pharoah as a two-to-three favorite (the equivalent of about a 60 percent chance of winning). If it feels like we’ve been here before, it’s because we have: Just last year, California Chrome (pride of Fresno County) was the Superhorse-du-jour before finishing fourth in New York. Part of this may just be a matter of specialization: Horses capable of winning both short races may be more likely to be calibrated to the shorter distance. It reminds me a little bit of the 200 and 400 meter sprints in human racing. There are a lot of sprinters who run both of these distances, but Michael Johnson is the only man ever to win both at the Olympics. 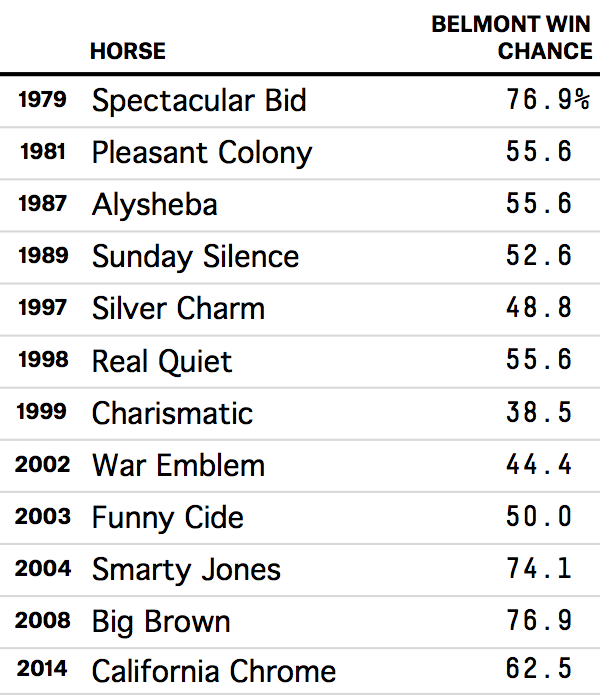 Also, Belmont entrants and winners that raced in both the Preakness and the Derby are becoming rarer and rarer—the last nine Belmont winners have skipped one or more of the precursors. This has led to some speculation that fresher horses have an unfair advantage in the Belmont. But even if so, this is another variety of the idea that horses that win the Belmont probably do so because they’re more targeted to it. If horses who won the precursors were at a big disadvantage in the Belmont, you’d think that horse-bettors would have picked up on it at some point. But the market has remained pretty bullish on Triple Crown contenders. You can see the chances of winning for each based on its final racebook odds to the left of this paragraph. Of the 12 Triple Crown potentials that raced, there were some big favorites, no big underdogs, and eight were better than even money against the field. Say you took $2 in 1979 and used it to bet against Spectacular Bid winning the Belmont at racebook odds, and then just “let it ride” — betting it all against every horse that won the Derby and Preakness. Assuming you gave up 15 percent to the “takeout” (horse racing’s equivalent of the rake) each year, you’d have over $15,000 today (with no takeout, you’d have over $100,000). While technically it’s possible that this has all been one big fluke, it seems pretty likely that the market has been botching this consistently. But the tricky thing about markets is that when you identify that they’re doing something wrong, betting on it requires presuming that the rest of the market hasn’t identified the same thing. We’ve seen an impressive horse before and thought: “Wow, the market sure screwed this up in the past. But it must have gotten wise by now and [insert superhorse here] must be the real deal.” But by the end of the Belmont, not so much.